I was once an avid bicyclist. With my best friend Nate, we would regularly ride from Mililani to town and back. I wore a bicycle chain as a bracelet for years, airport security scanners be damned. We even rode the Century Ride… although we rode mountain bikes, and the 100-mile road trip took us just short of 12 hours. But things have been looking up for bike riders in this city lately. The birth of Bikeshare Hawaii (now preparing to choose an equipment vendor) is only the latest milestone in an island-wide effort to get people out of their cars by offering better ways to get around town. This month marks one year since the city started laying the groundwork for the King Street Protected Bike Lane, spanning two miles from Alapai Street to Isenberg Street. It opened to fanfare (and some driver confusion and frustration) in December, and was turned into a two-way cycle track in May. Pitched as a pilot project, the city declared it a success, saying the number of bikes along the major thoroughfare soared 71 percent (and bringing pedestrians relief by reducing the number of riders on sidewalks by 65 percent). But the protected bike lane is just two miles long, a small part of the island’s 46 miles of bike paths, 52 miles of bike lanes, and 36 miles of bike routes. While the City and County of Honolulu was named a bronze-level Bicycle Friendly Community by the League of American Bicyclists in June, there’s a lot more that can be done. 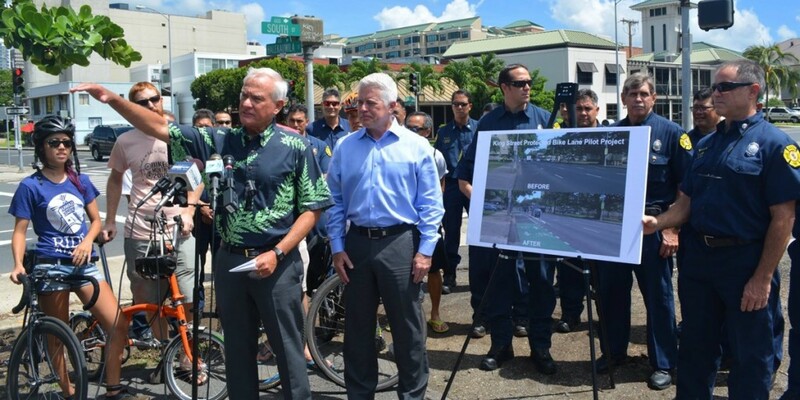 On Friday, Honolulu Mayor Kirk Caldwell announced plans for the city’s next bike lane expansion, connecting the east-west King Street track to a north-south protected bike lane on South Street. It would run from King Street down to Ala Moana Boulevard, which has an existing bike route. Of course, the announcement has met with early resistance from area businesses, who — like their peers along King Street — are worried about the potential loss of street parking. I admit, I like my car. And I am one of the thousands of people who commutes to and from town in the nation’s third-worst traffic. I doubt that many these alternative transportations plans will benefit me personally. But I’m glad that they are moving forward, and I’m glad that people who live and work in town are getting safer and more convenient options than driving their own cars. Frankly, just seeing the protected bike lane on S. King Street makes me feel like I’m living in a more enlightened city. 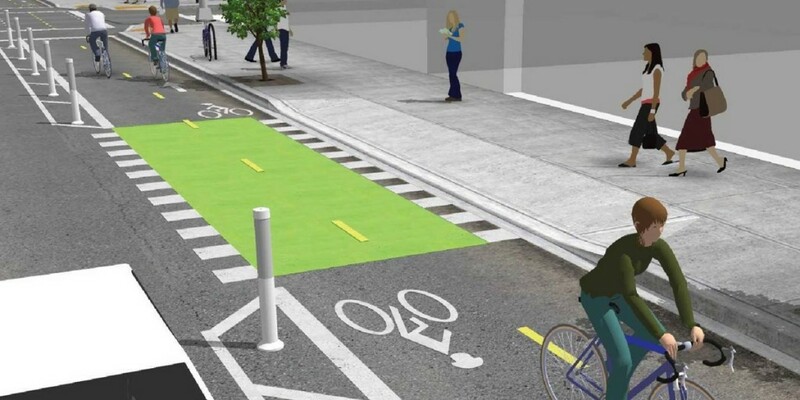 Whether or not you agree, the city transportation department will be hosting a public meeting to share and answer questions about its future bikeway plans. It will be hend on Tuesday, Sept. 1 at 6 p.m. in the Hawaii Room at the Neal S. Blaisdell Center. For more information, visit the Future Bikeway Projects event page on Facebook, the city’s Bicycle Program Facebook page, follow @BicycleProgram on Twitter, or the official Bicycle Program website. Photo courtesy the City and County of Honolulu Bicycle Program on Facebook.